One of our solar experts will be in contact with you shortly. Interested in saving even more? Commercial solar power provides multiple benefits businesses in a variety of industries. 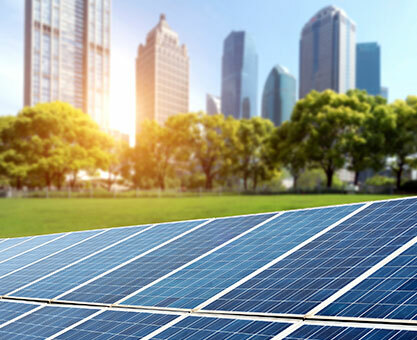 The addition of photovoltaic modules, or solar panels as they are commonly called, is a relatively simple process for commercial buildings and agricultural facilities. The installations are made easy by the availability of under utilized land or roof space. These modules are made of poly or mono silicone ingots that collect light photons and convert them to electricity. The electricity produced is fed into inverters that change it from DC to AC. Typically this power is fed back into the utility grid to offset the power that is normally be drawn from it. This type of solar power is referred to as “on grid” as opposed to “off grid” where the power produced by the panel is fed directly into the building or facility. The advantage of on grid systems, over off grid, is that the system does not have to store or generate power for use during non-daylight hours. The installation of commercial solar power systems offers many benefits, both economical and ecological. The first realized economic benefit is the reduced amount of purchased electric power required to operate the facility. With the net metering programs adapted by most states publicly owned utilities are required to purchase excess power produced by photovoltaic systems. If the rate being charged for power by the utility should increase, the amount being paid for excess production will increase also. In addition there is a federal tax incentive in place for commercial solar system installations and also many state incentives such as tax breaks, low cost loans, grants and rebates. These vary from state to state and are detailed in the individual state pages of this site. Another upside to the installation of commercial solar power is the ecological benefits. Solar power is embraced by the Go Green community as it is clean and leaves no carbon footprint. It also reduces the demand for fossil fuels, preserving valuable resources while lowering the demand for foreign oil. Determine how much you can save by switching to solar today. Switching to solar could save you as much as on energy costs every year. Get a quote below or call us to learn more. Based on our advanced calculations, your business is ideal for Solar Power installation! Contact us by calling or clicking the button below to learn more. Get Quotes From Solar Experts! **Savings calculated based on location and state averages. Will the system still produce power even on days where there is little or no sunlight? Yes. The power will be produced as long as there is any light but production is greater with increased sunlight. Are there large upfront costs involved with the installation of a photovoltaic system? The costs associated with the installation vary depending upon several factors. Rebates exist in many states to offset the cost. Low cost loans are also available in some states to businesses that plan to construct solar system installations. Third party ownership is another option in many states where equipment can be leased often at little or no cost. Leased equipment does not offer the same return as ownership because you are paying the equipment owner for the power the system produces. Bear in mind that the long-term savings accrued by owning a system will eventually pay for the purchase and installation of solar panels. What are the incentives available? Incentives are different in every state. They can range from rebates to tax breaks to grant programs. Solar professionals for each state are available through 123SolarPower to answer any questions and help with maximizing your solar incentives. To find out what savings are offered in your area use our zip code finder. Why would I want to produce power for the utility provider rather than keep it all for my business? Power produced by photovoltaic systems must be converted to AC and is only available during daylight hours. Storing AC power is very costly as is running a backup generator. Feeding solar electricity into the grid assures that there will always be adequate power at any time regardless of day or night, clouds or sun. Excessive power produced during optimum conditions causes the electric meter to run backwards, adding credit towards your utility bill.